I used a simple hombrewed Ground Plane antenna for receiving the Weather satellite transmission by NOAA at 137 MHZ using a RTL SDR dongle. My setup is very simple. RTL SDR dongle with SDR# software installed on a Windows 7 laptop. WXtoImg is used to decode the NOAA transmissions. Audio from the SDR dongle is bypassed to the WXtoImg using VA-Audio virtual cable. 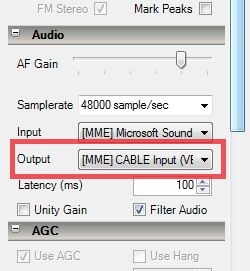 What this does is, once installed creates a virtual Line IN like port and a Line Out like port. 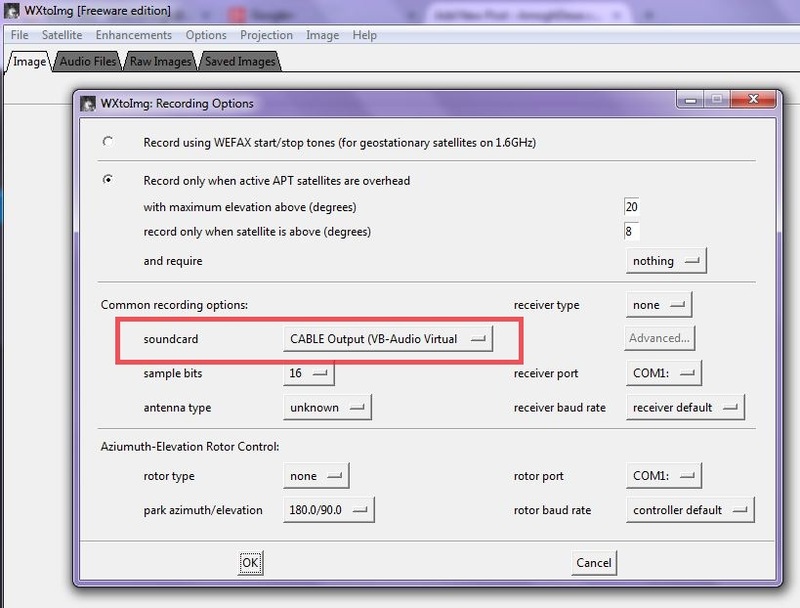 Go to WxtoImg, under Option go to Recoding Options and under Soundcard select Cable Output. What this does is, it creates a virtual audio cable to transmit the signal from the SDR# application to the to WXtoImg application. Once this is all set go to SDR# and make sure your AF Gain is good enough. 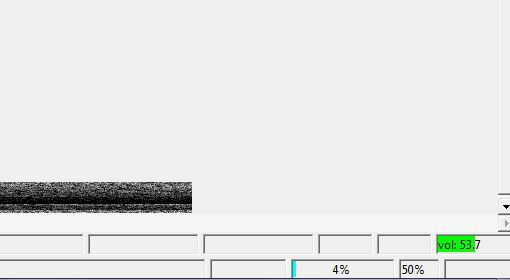 Start SDR# and come back to WXtoImg and test record to make sure the it is getting the signal from SDR#. the audio level in WXtoImg is shown at the right bottom corner of the screen and it should be around 50 atleast. With this you are all set to receive the signals from SDR# to yoyr WXtoimg. now wait for the time the satellite is going to pass over you, use the Satellite pass-list option from the WXtoimg under File menu to see the local time of the pass. 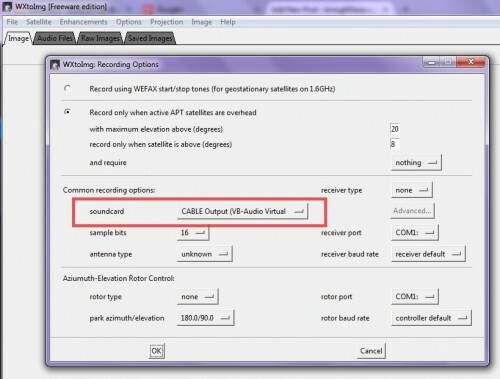 once it comes close select Record option and set to Autorecord. Go to SDR# and set the frequency of the transmission. For me it was 137.1000 Mhz for NOAA19, put SD# in WFm mode with around 35Khz as bandwidth and wait for the transmission to start. As the satellite passes from your location it will capture the image and start transmitting and you will start receiving the audio. 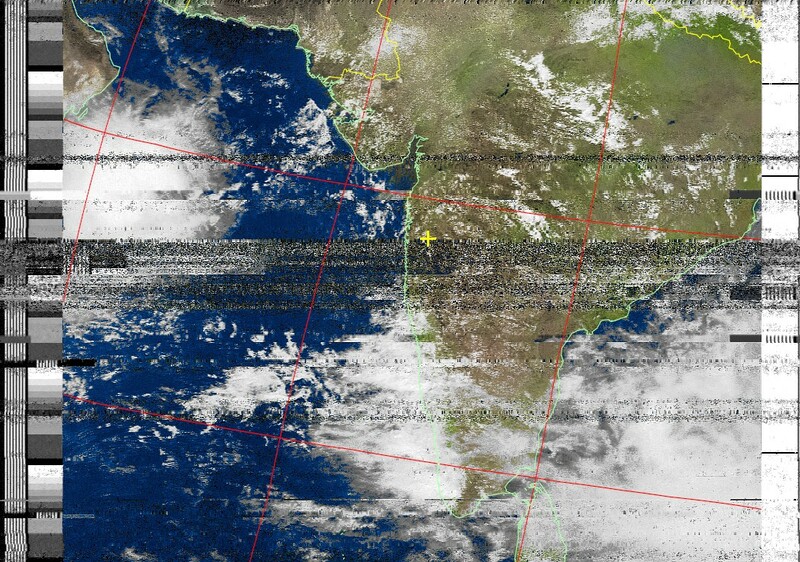 NOAA weather transmission received on 13/06/2014 at 1410 Hrs using RTL SDR dongle. 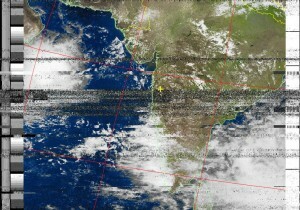 So this is it, finally I was able to get a clear NOAA transmission. If you see by 13th June the south-west monsoon has reached the lower parts of Maharashtra. Rains are coming! A better antenna like a QFH will further improve the quality of your audio and the image. May be ill try that in the future. In the meanwhile if you have any suggestions or feedback, leave your comments below!